It’s as light and fluffy as one of Agnes’ stuffed unicorns, but Despicable Me 3 still packs enough goofy charm to earn a modest recommendation. The first two adventures with Gru (Steve Carell, The Way Way Back) were endearing animated features buoyed by strong storylines filled with character growth and minions. Loads and loads of minion mayhem. This third outing is a little lacking in both of those traits. The story’s decent enough, but it carries a slight sense of being rushed and feels a little more on the scale of a direct-to-video tale. The main bad guy this time around is a former child TV star, Balthazar Bratt (Trey Parker of South Park fame). His glory days were in the ’80s, when his show, Evil Bratt, was popular. He’s still big on chewing gum, blowing bubbles and wearing shoulder pads. And now he makes the headlines as a real-life master criminal. During one particularly nefarious plot, Bratt gets away with a giant pink diamond, leaving Gru and Lucy (Kristen Wiig, Zoolander 2) in the lurch and on the hot seat with the Anti-Villain League. Having lost their jobs with the AVL, Gru and Lucy spend some time visiting Gru’s family back in his home country of Freedonia. That family includes his twin brother Dru. Dru’s basically a schlub; he’s mostly a good guy, but he’s utterly inept, and he wants to follow in their father’s footsteps – as a force of evil. That’s a line of work Gru put behind him, but being unemployed has its way of leaving extra time on Gru’s hands. There’s plenty of silliness to be had as Bratt attempts to attack Hollywood with his evil toys while Gru and Lucy seek redemption (and, for that matter, Gru and Dru seek retribution). 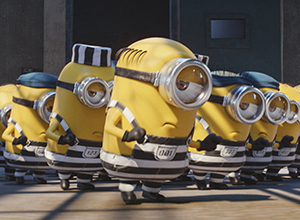 At the same time, Gru’s minions strike out on their own, also in search of an evil line of work. But, hey, when the pizza delivery guy passes by them, it’s time for food! The minions inadvertently find themselves on stage at a singing competition and steal the show. It’s a crime that earns them some hard time in prison. But not to worry; there’s more silliness to be had as the minions take over the Big House and set the regular big, bad inhabitants on edge. Tack on sweet little Agnes and her desire to help out Gru and Lucy – and to find a real-life unicorn in the wilds of Freedonia – and the fun elements are all there. There’s a lot of color, some good laughs and an overall pleasant 90 minutes of animated screwball comedy. Even so – and even with catchy new songs from Pharrell Williams (albeit, none on par with Happy) – it seems as though the grind of a new Despicable movie every two years (including the tangential Minions outing) is too quick of a pace. A little more baking time could’ve made this confection sweeter. As it stands, the ending of DM3 leaves the door wide open for a DM4, plus there’s Minions 2 already set for 2020. It’s a rather breathless rush of minions and spy spoofing that’s quickly turned what was a thoughtful, fresh, whimsical whirl into a too-frequent trip to the well. Phew. In the thick of it all, the summer of 2017 is experiencing some franchise burnout. The freshness factor is hard to maintain as the episodes and characters become more familiar. Here in particular, there’s a sense of a rushed production. There’s no jubilant minion cavorting accompanying the end credits; it’s a downgrade in effort that doesn’t go unnoticed. But at least those crazy minions manage to maintain a certain amount of unpredictability during their relatively limited screen time.